I'm on a baking streak, sort of. It happens a few times a year. My favorite sweet treats to make are brownies and banana chocolate chip muffins. 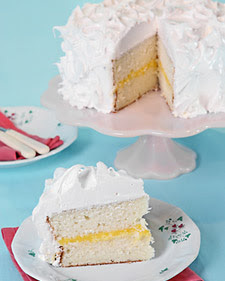 Right now, I'm making a moist cake with lemon curd filling and white frosting. I simply used a basic yellow cake mix from a box, and customized everything else around it. The lemon filling is a Martha Stewart recipe I got online. It's a stove-top concoction of egg yolks, lemon juice, lemon zest, sugar, and cold butter. It was my first time to make it and was surprised at how easy it turned out to be. It's tangy and sweet in all the right places. I made it before the cake and it's now waiting to slathered between two lemon-flavored layers (I used some of the juice and zest on the cake to flavor it as well). The most fun part for me is making the frosting. I think I initially only wanted to bake a cake so I could finally make some fluffy white icing. I've been wanting to make birthday-cake frosting for years but I wasn't sure how exactly to go about it. Growing up, one of my aunties owned a bakery and I watched her pour hot syrup over whipped egg whites (come to think of it, I did grow up around sugar...). Recently I saw Paula Deen on Food Network make a version of it by placing the egg whites, sugar, and water over a double boiler and beating everything together until thick and gooey. That was my cue to finally get start whipping. You'll find said recipe here, or you can also try a marshmallow-infused version here. Now excuse me, while I go back to my cake. DAY 23 My Sharpie Giveaway!